Thanks in part to the restoration work of the Sutton Center, the Bald Eagle was removed from the endangered and threatened species list on June 28, 2007! The Sutton Center’s successful Bald eagle recovery efforts are described below. Between 1984 and 1992 the Sutton Center raised and released 275 Southern Bald Eagles in the southeastern U.S. Bald Eagle eggs were removed from nests in Florida and transported to our captive breeding facility in Bartlesville, Oklahoma. Once at our captive breeding facility, the eggs were incubated, hatched, and the resulting eaglets were raised and released in high quality habitat in five southeastern states. In many cases, the captively-raised Bald Eagles have returned to their release sites to establish territories and nests. Each year we conduct aerial and ground surveys in the vicinity of Oklahoma release sites to determine nest occupancy rates and productivity. Since 1990, the number of Bald Eagle nests in Oklahoma has increased almost annually to a record 55 nests in 2005 (see graph below). We believe these increases are a direct result of our restoration program, as adult eagles are now returning to breed in the areas where they were released. In addition, eagles released by the Sutton Center have been observed nesting in Kansas, Texas, Georgia, Alabama, and Mississippi. As fledglings from these nests reach adulthood, we expect the number of nests to continue to increase. Partially as a result of our efforts here at the Sutton Avian Research Center, the Bald Eagle population in most areas of the U.S. had increased sufficiently for the U. S. Fish and Wildlife Service to remove the Bald Eagle from the Endangered Species List in June of 2007! The above graph indicates what an outstanding success the Sutton Center’s Bald Eagle reintroduction program has been in Oklahoma. 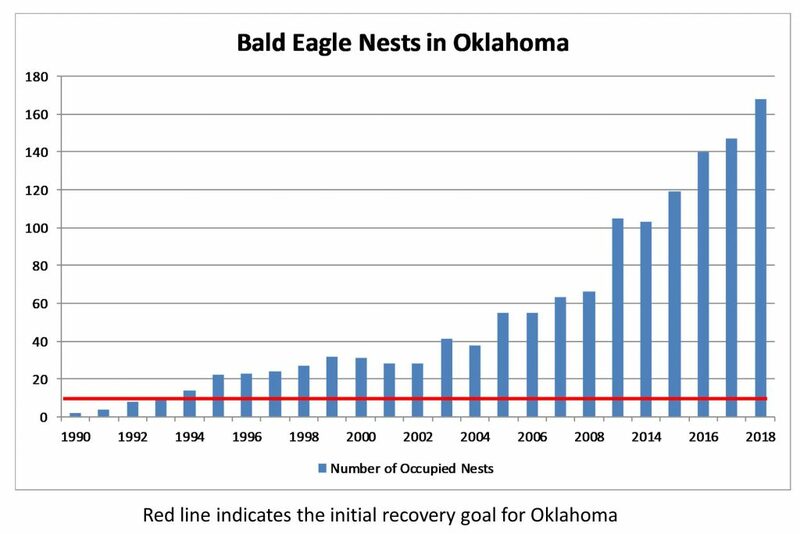 The recovery goal for Oklahoma was 10 eagle nests, a number that has now been greatly exceeded! The large spike in 2009 is due to extra aerial surveys we were able to do which enabled us to discover nests in areas we had not been able to survey previously. While we lack thorough data for our other release states owing to survey funding limitations, evidence suggests highly significant successes there as well. While we celebrate the removal of the Bald Eagle from the Endangered Species List, we have taken a moment to celebrate and to honor several individuals and one foundation for their integral roles in making this project possible. A well-attended, standing room only, black-tie event took place in July, 2000, in Tulsa to recognize those who so generously supported the Bald Eagle recovery project from its very beginning, and actually helped to establish the Sutton Center. Pictured from left to right are Joe Williams, Bob Lorton, Harold Price, the late Jack Zink, Len Eaton, and Judge Joe Morris representing the Sarkeys Foundation. The Sutton Center is indeed grateful for their support. 3 – Use realistic eagle hand puppet to feed eaglet so they don’t imprint on people. 6 – Celebrate when the grown eagles return to their adopted home to breed!